Due to personal reasons, our review of the game was unable to be published alongside the launch of the game, so we took the opportunity to launch our review alongside the lift on our spoiler ban. As a result, THIS IS A SPOILER REVIEW AND SPOILER CONTENTS ARE DISCUSSED THROUGHOUT. Please do not read this review if you do not want to be spoiled on end-game content, including the post-release epilogue and secret ending. 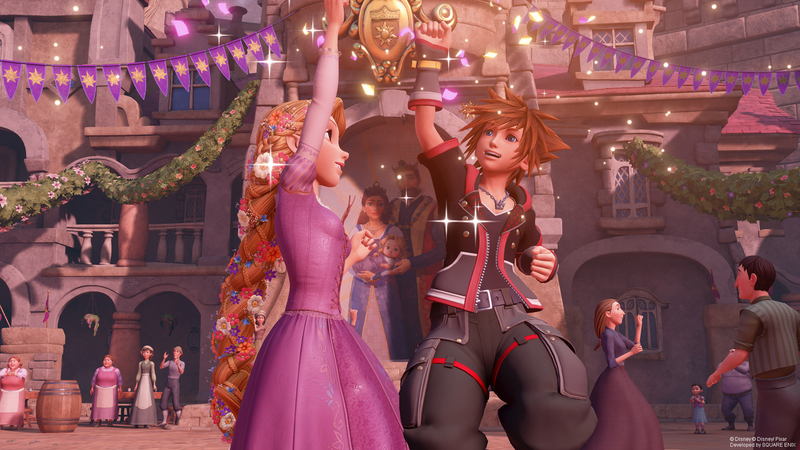 Kingdom Hearts III is the cumulation of (more than) several games in an epic series that deals with the themes of friendship, love, loss, and the quintessential battle of light versus darkness. The game follows Sora, alongside Disney icons Donald Duck and Goofy, as he trys to unlock the Power of Waking while traversing colourful worlds based on popular Disney films. From the outset, it is clear that the game is rewarding long-term players and fans who have followed along and know the various characters and their history. It’s easy to imagine newcomers or fans who haven’t been with the series in over a decade getting lost with exposition about Data Worlds, other Keyblade Wielders, and why Sora wishes for Roxas to return. The story shamelessly leans into its own history, and it feels like a rewarding celebration for the fans who have stuck with the series. As Sora embarks on his newest journey, he crosses new and old Disney and Pixar worlds. Each world offers either a unique story or gives a Kingdom Hearts twist to the movie storyline. It is more noticeable than ever that the series is copying movie scenes into the game, but it pays off as the recreation is faithful to the source material and looks absolutely stunning to boot. The pre-rendered videos for worlds like Arendelle and The Caribbean elevate the visuals of the game to another level, and it’s a joy to be able to enjoy these scenes play out. 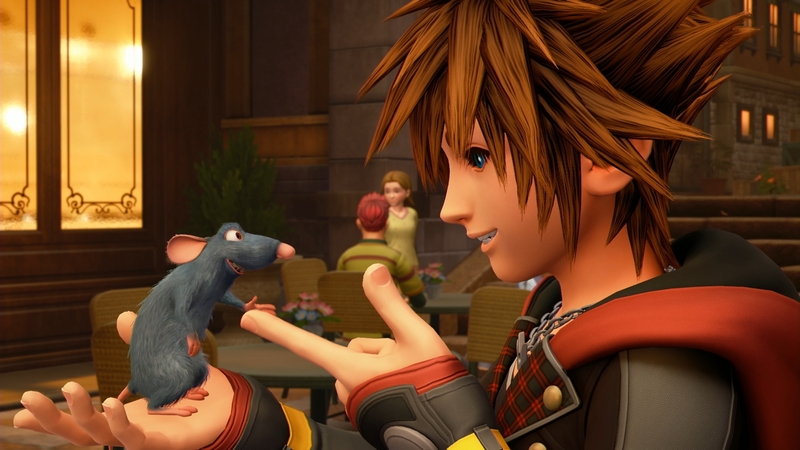 Each world tries to provide Sora with lessons to learn, and tries to tie the main storyline in with the events of the game. Olympus is fantastically used as the opening world in which a weak Sora seeks out advice on how to regain his lost strength, Toy Box deals with the strain of a heart and how bonds can still grow from that, and San Fransokyo brings up a discussion about darkness with in a friend’s heart and how no one is beyond saving. The only world that serves little purpose in the game is the 100 Acre Woods. The story, that Sora and Pooh’s connection has weakened, should have been something to really affect players who have seen Sora and Pooh’s relationship grow over the course of three games, but with how short the world actually is, the purpose of the world leaves much to be desired as it is a story that doesn’t seem like it was ultimately worth telling. It has gorgeous cell-shaded visuals, a visual flare not capitalised elsewhere in the game but that is all the world really has going for it. Not to mention that once within the world the player has to replay three almost identical mini-games in order to get through the world, and then it is over. The game has a problem with pacing, as the majority of the story is withheld until the Disney worlds are complete. There are usually one to two cutscenes that advance the main story in-between Disney worlds, but the story that the game has been trying to achieve only kicks into gear once Disney is out of the way. It quickly resolves several plot points, teases reunions and character interactions that fans have been wanting to see for years, and then the game ends. The battle gauntlets with each member of the True Organization was well done, especially since it gave Sora a chance to speak to those characters and give them closure. It is unknown how many of these characters will re-appear again, since the backstories of some are teased, but it seems safe to say that a lot of characters have been retired after their boss fight. A problem with a lot of the main story in Kingdom Hearts III is that it focuses a lot on what comes after. There’s a lot of set up in play for this game, and for a game with one of its major themes being resolution, it feels like whiplash to be experiencing a lot of set up. Maleficent and Pete, who seemed like they would have a big part to play with their search for the elusive Black Box, are barely in the game. Isa’s personal motivation is changed to revolve around a girl, Kairi is gone and so is Sora, and suddenly four of the five Foretellers are back. The game follows through on having this be the end of Xehanort’s story (or so it seemed before the epilogue showed Eraqus and Xehanort preparing for a new game to play with each other), but too much of the game is focused on the after. As a result, the actual end of the game feels rushed and confusing. Sora leaves to use the power of waking to rescue Kairi, but it is unclear if he was successful in this, as it shows Kairi having returned but Sora lost himself in the process (the events in-between is ignored completely and it’s not clear what exactly the ending is actually showing). It seems clear that whatever does come next could possibly tie-in with a video game realm, as both Kingdom Hearts III and Kingdom Hearts Union X have teased video game worlds. But whatever the event, it’s a shame that a lot of events in the game were spent on setting up any potential future game rather than focusing entirely on what all the previous Kingdom Hearts games were setting up. 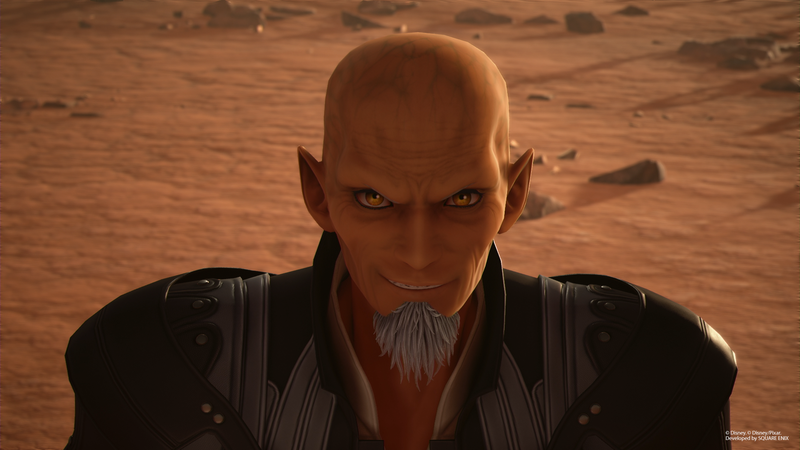 Overall, the conclusion to Xehanort’s arc was ultimately satisfying. A lot of characters were fleshed out and there were so many enjoyable moments in the game, from both Disney characters and original characters. A lot of satisfying story beats were hit, with reunions that tugged at the heart strings, with some story beats being disappointingly glossed over, such as Ventus and Roxas interacting. The gameplay in Kingdom Hearts III is an evolution of every title before it. With the command menu from Kingdom Hearts, Kingdom Hearts II, and Kingdom Hearts 358/2 Days having made its return, the gameplay has been simplified to work with menu based options as opposed to letting the user choose the limited amount of attacks they’d like to bring with them into battle, ala Kingdom Hearts Birth by Sleep, Kingdom Hearts Re:coded, and Kingdom Hearts Dream Drop Distance. Sora now has access to shotlocks, however this time they are tied with what Keyblade Sora is using and each Keyblade has multiple shotlocks available for use. Keyblades also offer up additional stat boosts and abilities, proving them to be more versatile than ever before, and can be upgraded to increase these stats in the Keyblade Forge, a section of the Moogle Shops where you can trade synthesis materials found in the worlds and Other Sky to increase the Keyblades strength. Unfortunately, unlike Kingdom Hearts Union X, the Keyblades don’t change or get a glow with sparkle effects when the Keyblade is levelled up. There’s no visual change between a level 1 Keyblade and a level 10 Keyblade which is a bit disappointing. Magic has become more versatile than ever before. Fire, Blizzard, and Thunder’s visuals and usage carry over from Kingdom Hearts 0.2, but this time Sora now has access to Aero and, in a series first, Water magic. Aero is like blizzard, in which you can use it to create a flowmotion bounce pad which adds to the depth of gameplay and increase the potential for combos, whereas Water acts as a small shield before becoming missile like and striking down enemies. When Sora enters forms, the use of magic can change too, for example Fire goes from a projectile to becoming a defensive circle around Sora. New wall running mechanics, which were a bit dicky to use in the demo, have been improved for the final release and hit home how much of a leap this game is compared to previous Kingdom Hearts games. Being able to scale Mount Olympus without a load screen is impressive by itself, but with the inclusion of multiple gigantic walls to scale and height to gain, it seems even more impressive due to the sheer scale of the worlds. The same excitement is felt in many worlds, with Arendelle having many cliffs to scramble up and San Fransokyo having skyscrapers to get to the top of. This verticality is something the series has never had, and it’s fun to boot. It wouldn’t be worth it, however, if the player wasn’t rewarded with secrets and treasures and thankfully a lot of the big walls to run up have surprises to get. Battles themselves are pretty standard to any Kingdom Hearts veteran. 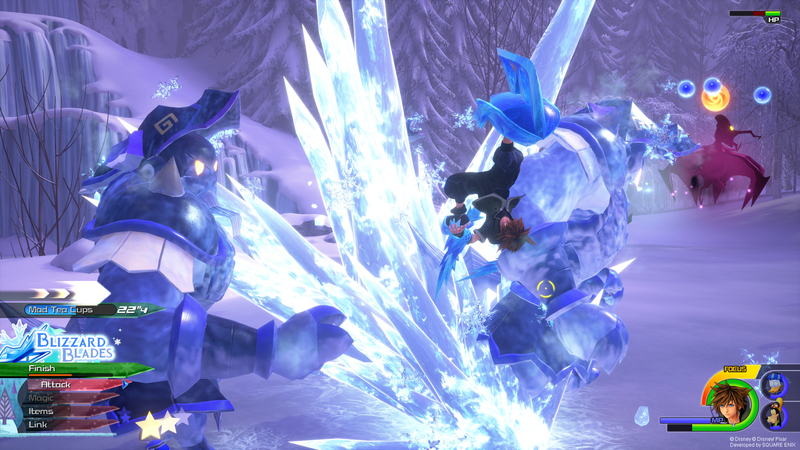 The hack and slash gameplay remain relatively unchanged, with abilities gained through levelling up that grant Sora with new gameplay moves and skills. 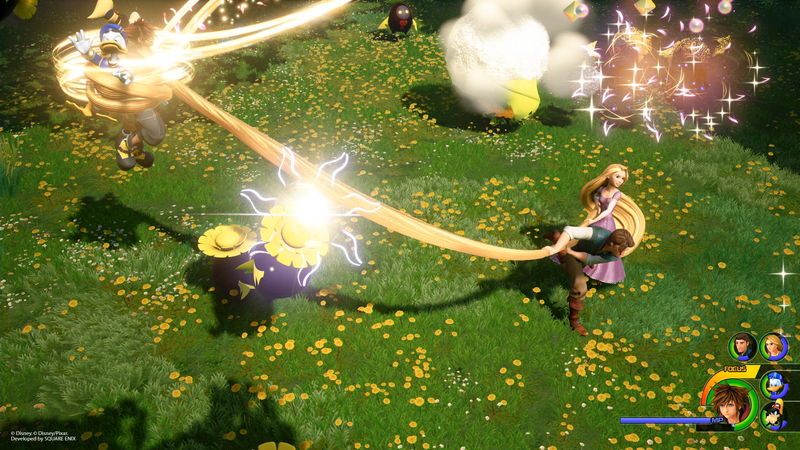 After the tutorials, the player has the freedom to enter battle with an arsenal of abilities, magics, and links. Magic is powerful and some spells can deal massive area of effect damage, or a form can be entered that shakes up how Sora moves and attacks and is affective against certain types of enemies. 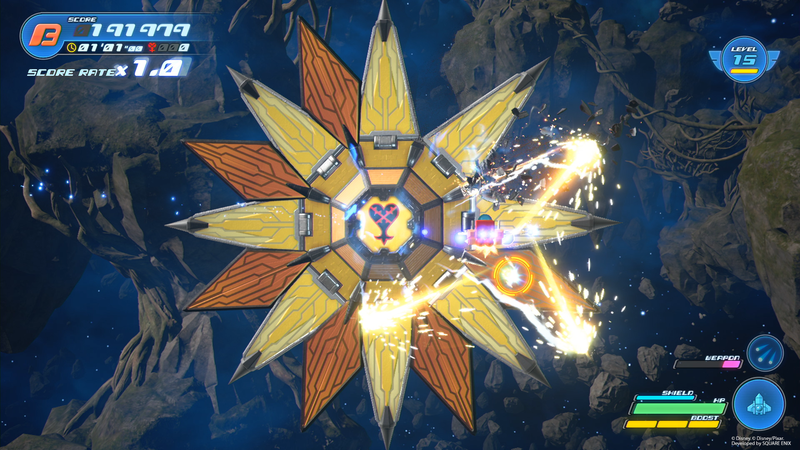 Players can also equip three Keyblades to bring into battle, and are able to switch between the Keyblades with the D-Pad. This means forms can be stored during battle and saved for tough, scripted battles or for boss battles. It’s an innovative change that helped keep Keyblades relevant throughout the game. With all these changes and additions to the gameplay, it’s a shame that the game errs on the easier side of difficulty, even on Proud mode. There are so many options at your disposal that it trivialises battles, and once you find a way to quickly crowd control, then every encounter can be completed by repeating the same commands. There’s little strategy with a lot of the encounters, which is a shame due to the spectacle of each different gameplay style. Battle portals are a welcome addition to the game, however there are only a handful of battle portals scattered throughout the worlds that it is quite quick for them to be completed with little incentive to play them again. The game disappointingly lacks a coliseum, ala previous Kingdom Hearts games, as well as the ability to replay boss fights. With only 10 save slots being available to the player, it’s harder for someone to decide what bosses they’d like to have saved so they can replay the fights. Hopefully a future DLC release or patch could add in the ability to replay boss fights. 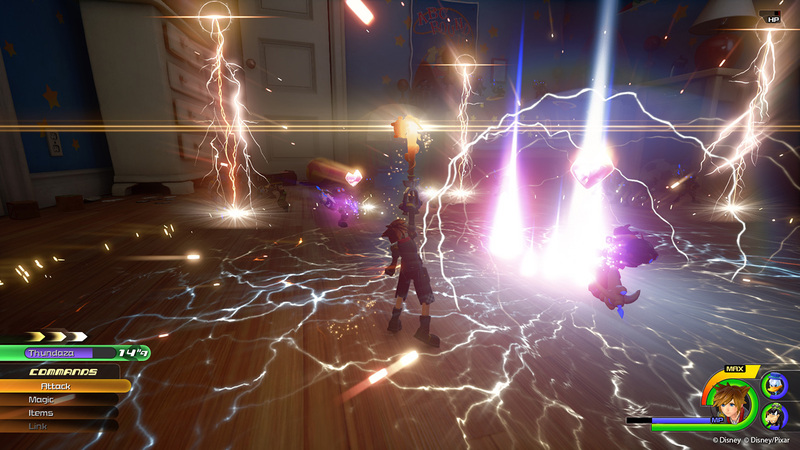 Kingdom Hearts III is the first full title in the Kingdom Hearts series to take advantage of Epic’s Unreal Engine 4 engine. Each world takes on a unique look that really pushes the PlayStation 4 and Xbox One consoles to their limits, and the various landscapes are so different in visuals and scope that it is amazing just how much variety was crafted for this game. Worlds that have previously appeared in the series have been given a major overhaul. Twilight Town has gotten a massive upgrade, with the Tram Common area feeling like an actual, lively town where the denizens of that world gather together, chat, shop, watch movies, and eat at Scrooge’s restaurant. It’s unfortunate that the full world wasn’t available to the player, as one can only imagine now just how good the station, sandlot, and the usual spot would look now. Hercules has been expanded past the Coliseum, with Sora finally able to explore Thebes itself, Mount Olympus, and the Realm of the Gods. The world, which is the first world players explore, features various visual differences within it which is incredibly impressive given how large the world is. 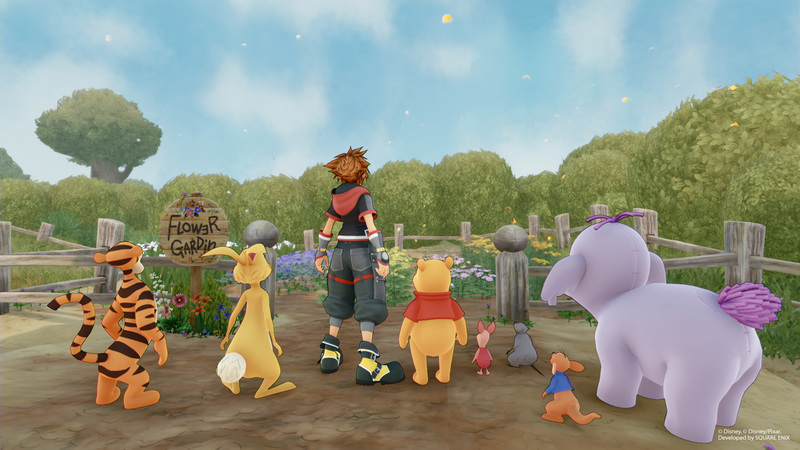 Even the 100 Acre Woods, despite not being very large, takes on a new visual look for this game that not only differentiate it with the other worlds in the game, but with the previous incarnations of itself. It looks like a Winnie the Pooh storybook that has been lifted off the page and onto the television. The quality of the visuals takes a slight dip as the game progresses, mainly in San Fransokyo. The city is gorgeous and a treat to explore, but some of the buildings and assets in the world look a little unfinished. With the world being available in both day and night variants, it would have been nice to have a bit more polish within that world. The Unreal Engine has been a fantastic fit for both the Osaka development team and the Kingdom Hearts series. Gorgeous results have been produced because of the engine, and it’s reassuring to know that due to the success of the engine within Square Enix (as it has been adopted on some other games in the company, such as Final Fantasy VII Remake) that any potential future Kingdom Hearts games will be developed on it as well. 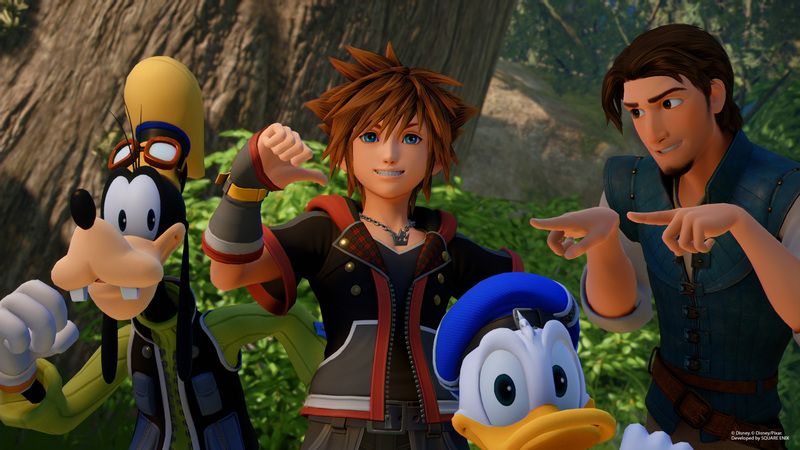 There’s a lot to do in Kingdom Hearts III, aside from grinding levels. Each world features unique mini-games and side content, including 90 Lucky Mickeys and The Flantastic Flan missions. There’s a lot of charm to be had in a few of the mini-games, such as the Dance Festival mini-game in the Kingdom of Corona, but some of the other mini-games feel a bit soulless with their execution. The Frozen Slider mini-game has little purpose and forces replay-ability due to the 10 collectable gems, where there’s no clear indication of where they are hidden within the mini-game. There’s little challenge to be had, and what challenge there is comes about due to the lack of clear indication during it. There’s also an issue to be had with the three, almost identical, mini-games in the 100 Acre Woods. It’s baffling to think that someone approved the 100 Acre Woods mini-games having to be played six times (three times for the world’s story, three more times for Jiminy’s Journal). Collecting ingredients, thanks to Donald and Goofy for pointing them out, became fun with how many meals you could cook alongside Little Chef. The cooking mini-games were short and fun, providing the perfect appetiser for a break from the main action. Another form of collectable were the Classic Kingdom mini-games. Based on old Mickey Mouse shorts, these games resembled old school LED games. There are more than 20 to collect, with each one providing a different challenge. Mickey Cuts Up was a personal favourite, however I would live comfortably with never having to play The Mad Doctor again! With the extensive amount of Classic Kingdom games available, players will be able to take a break and relax when enjoying these lovingly crafted mini-games. And lastly the worlds are broken up by the Gummi Ship, which has been completely overhauled since it was last seen in Kingdom Hearts II. Flying around in the Gummi Ship is daunting at first, but as the game progresses it becomes fun to be able to search for hidden crystals, fight battles and bosses, and explore the Other Sky. The Gummi Ship had finally been made fun, and it was a joy to be able to experience it between the worlds. 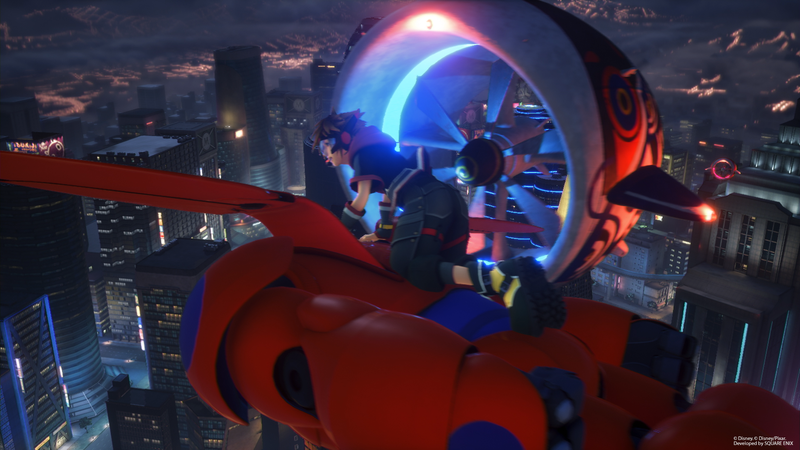 There was a lot of expectations and desires riding on the shoulders of Kingdom Hearts III. While there was some story that was iffy and downright disappointing, the game does manage to tie up a lot of loose ends, and it feels like a celebration for those who have kept up with the series. The Disney worlds are gorgeous and feel like they have been ripped right out from the movies. It’s never been such a joy to experience Disney worlds on this scale before. Sorry for the big delay with this. I had time to play KH3 but then I got slammed with work (I am not lying when I say that I have 0 hours of free time per day). Hopefully this all makes sense and flows and I didn't contradict myself. I wrote this while ill, coming off a 10 hour shift on a Thursday morning, and I hadn't slept in 18 or so hours. I just wrote from my heart about my experiences with the joy of Disney and the disappointment with a few areas of the game, some that have been echoed around for the last month. I absolutely hate the secret ending and everything about Nomura's attachment with Versus XIII so the fact that a lot of the game was about things that come after KHIII really irked me. Well, that's my explanation for the long rambling that I wrote. Again, sorry it took so long! Thank you for this review. I am so beyond tired of seeing this whole this game is terrible all I see is negative. I don't even see the negativity. Everyone I know loves this game. And it has a solid B all across the scoreboards online. This game is great, is there issues, yes just like with every other game but that does not erase all the positives about this amazing experience. I cannot wait for the future and which Disney Worlds will be in the next installment. Gameplay is the best it's ever been and it being too easy will likely be fixed with critical mode. Can't wait. If people want to see a bad game, look no further then the recently released Jump Force and Anthem. Those are BAD games. Great review Chaser. I agree with most of the positives and negatives. Yeah, I like this review, it has that balance of pointing the good elements and bad elements at equal measure. Most people have been so reactionary and tip the scales either to heavily to the positive or to the negative. A great review, and wow, I thought I was the only one who wasn't too hot on the secret ending, with my reasons being very similar to yours. [*=left]Sora not being on the cover of the book was due to his previous attack from Xehanort during DDD. [*=left]His absence of the book also forshadowed the game's ending when Sora use to revive Kairi but disappears in the process. [*=left]Sora experiences with Pooh made him being determind on not wanting to lose his friends again. Fantastic review! I also found 100 Acre Wood to be redundant. I know it has served as a mini-game world throughout the series, but this time around it really was lacking and pretty much unnecessary. I wish it would've been a different world, or at least had a few more interesting mini-games. This made me prefer KH2's Atlantica, which is something I never thought I'd say. Negatives aside though, I did really enjoy KH3, despite its flaws, and am definitely playing it again in the future. A game can never be absolutely perfect (only one game has come close to this, in my opinion, and that was HZD) and objectively it can never please everyone. Yeah this is mostly how I feel, though I personally am not opposed to the Versus stuff? If it's handled well. Also I am sorta down for DDD 2 lol, if that's what it implies we are getting. Mostly since I felt like Riku was lacking, well, a big moment like most other characters who took a step back for this game's narrative. Which I don't...jate as much as others but mostly because I am hopeful some will get more chances to shine later. For now I'm down with Riku saving what matters most to him again. Yeah I do believe this world had merit/foreshadowing as literally all of them did this time, but I still have to agree with the general consensus it should have still been a bit more than we got. Like in terms of content really, if they just wanted to spread out that theme a bit, that sounds fine. It seems clear that whatever does come next could possibly tie-in with a video game realm, as both Kingdom Hearts III and Kingdom Hearts Union X have teased video game worlds. Nomura said in the Edge Interview that there's worlds that were cut in KH3 that he didn't want to say what they were because of their inclusion in the next game. So I imagine there's likely two worlds from KH3 that will be used in the next game. We do know WIR is coming to Union Cross. Great review to a great game! Considering that the team is working on DLC and on a Final Mix version (the paid DLC, I guess) then I hope Nomura and the team address the issues laid out here and in other reviews to make the game Excellent! Critical mode is coming and should add difficulty and replay value to the game. Wholeheartedly agree that the story was rushed in the end. Nomura states that some story elements will be explored or expanded upon in DLC (Xion, specifically), but I hope other story elements and gameplay elements are expanded upon too (explorable Scala Ad Caelum, please). Some boss fights seemed rushed and it led to the story pay-off that felt disappointing for some long-time fans (SPOILER: I am personally talking about Anti-Aqua boss fight; an expanded fight like some I have seen on boards will be really great). I have high hopes for the future of this game this year and am hoping for greater clarity from DLC and updates. Can't wait for the future of Kingdom Hearts! May Your Heart Be Your Guiding Key! Yeah I think Wreck-It Ralph looks to be the world announced for Union Cross and the next KH game before KH4. Strangely enough it's been 3-4 years since Nomura announced we were going to get a new Disney world for Union Cross but we've heard nothing on it since October 2016 and basically they but moreso Square Enix have been shooting themselves on the foot lately. I wouldn't be surprised if Wreck-It Ralph was actually considered as world during the development of KH3, but was scrapped when they heard that Disney was doing a sequel to Ralph (Ralph Breaks the Internet), which is why he ended up as a link summon in the final game. Which is unfortunate as it would've been a spiritual successor to the Tron worlds in past KH games and have it be a world-within Twilight Town either at the Old Mansion or some Taito Arcade building. Hope to see Ralph and the other scrapped Disney films that were planned as worlds for KH3 in the next KH game before KH4. My God, that would make perfect sense. That Twilight Town segment feels like it ends sort of awkwardly, and it would be super easy to insert in a Wreck-It Ralph world there. It is sort of weird that he's in the game, since he has no prior connection to Sora, and he is unique (kinda) in that he's not element based like Simba, Ariel and Stitch are. His summon is also weirdly complicated. It could be this was just his team attack from the world, perhaps? I dunno. Perhaps this could have been the world Vexen or Terranort was connected to as well. And if you take the Sleeping Realms theory seriously, this could maybe be where Data Riku is supposed to be. And then the San Fransokyo Riku is the replica. A possibility. Nice Review, I think it managed to sum up nicely what worked and didn't work in this game. I do wonder how the updates will effect the negatives in the long run, but I guess we'll just have to wait and see for those to come out as the year progresses.